Have you ever been lost before? No, I mean REALLY lost? Especially with all the high tech gadgets out there now, it's probably unusual these days. I remember the first time I got lost. I was a new teenage driver on the interstate and somehow got off the wrong exit. I knew I wasn't far from home, but didn't yet know how to turn around and get back on. That was before cell phones and I clearly wasn't in an area where I could stop and ask for directions. I just recently experienced it again. I was on my way to meet my mom about an hour away. Unfortunately I didn't get clear directions or the final destination before I started driving. I got general directions from my husband and was on my way. I soon realized I was low on gas, but figured I'd make it. After driving 30 minutes or so, I realized I had missed my exit. My mom happened to call at the right time to help me out. She rerouted me and we were on our way, again. She basically told me to go all the way down a certain road and when I couldn't go anymore, turn left (which I soon found out was a common direction people gave in the area). After driving about 30 minutes out of the way, I ended up in this little ol' country town where gas stations are 25 miles apart, you drive by at least a million of the exact same looking trees, and you have no cell phone service! Thankfully I found a gas station and was able to refuel. Just as I got the correct address and punched it in on my phone GPS, my phone died! Now I was up a creek without a paddle because I had no idea where I was and no idea where I was going. After asking two different people for directions along the way, we managed to get there. Ever feel like this in life? Sometimes I do. I get lost. I forget my purpose. I feel like I'm driving by the same looking trees over and over again, seemingly going nowhere. My view ahead looks exactly the same as my rearview. I think about how I can get the most out of this season of my life and where I am supposed to be going. I know that God knows, but that doesn't always make the anxious feelings and thoughts easier to handle. I wonder is there really a destination for me? Will I ever get there? How will I get there? Will I like it or will I feel stuck? Will I feel alone or will there be people that come along on this journey with me, etc. I have to remind myself that God is a good God. He knows me. He knows my purpose and will choose good things for me that I will like as He has always done. I don't know what your GPS looks like, but on my phone the green dot is the starting point, the red one is the final destination, and I am the moving blue dot. Just like I look at my phone and see the overhead view, so does God. He saw my starting point, he sees my final destination, and I am the blue dot that he watches as I move along the map (Psalm 139). There is story after story in the Bible of God watching and knowing our lives and this brings me comfort. So though I still don't have the answers to where am I and where I am going, I know that He does. Though I sometimes feel lost, the truth is that I have already been found (Proverbs 3:5-6). One thing I've learned over the last eight years of mothering is that there are good times and not so good times. There are days where you feel like you're actually doing pretty good as a mom, your kids seem like they're growing in the right direction, they're good and easy for you, they seem happy and that makes you happy. But there are also those days that seem like weeks where everything seems like work. Just the thought of going out with the kids seems overwhelming, yet if you stay home, your walls might cave in on all of you and you might not survive. They argue, they complain, they whine, they fight, they argue and complain some more, and by the end of the day, you collapse. It's amazing how the weather has a lot to do with it. Two weeks ago it was warm and beautiful. Days full of swimming potential. And we took full advantage. This past week however has been rain every day. We've been stuck inside. You can only watch so many movies, play so many games, make so many cookies, take so many naps, have so many time-outs before you quickly feel like you've run out of options. I used to think I wasn't a self-motivating person, but motherhood (i.e.desperation) has turned me into one. I read as many mother centered books and magazines I can, I listen to family focused podcasts, I read the Bible as much as I can, I get busy, I slow down, I spend time with other moms when I can and all of that has truly helped to get me through. I find that staying a "learner" helps to keep you moving so you don't get stuck. I love hearing other mom's real life stories to find out they don't have it all together either. They too, like all of us, have good days and not so good days. It helps to remember this is a season of life. There will be change up ahead. It's not knowing how and when the change will come that is hard for most of us. Deuteronomy 31:8 "The Lord goes before you. Do not be afraid. He will not forsake you." We started the day hanging out in our pjs until 11am, went to a party, swam in a pool, walked in a parade, ate tons of food and dessert, and ended the night with a firework show at a local church. Mazie's not liking the fireworks too much. She's holding on to daddy for dear life! We've been spending a lot of time at the pool this summer. Gabe is a fish and Mazie loves the water! This was by far the best birthday party location we've ever chosen. We had a huge party room to ourselves, two attendants, a tour with a tour guide, a scavenger hunt, fugde samples, pizza, soft drinks, cake and ice cream, a special present for the birthday boys from Cabela's, fish food, and best of all very cost effecient! Everyone had a great time. I just love showing up, having fun, and leaving! Feeding the fish and Aunt Brigette! Birthday boys!! Can't believe they are 8 and 6 already!! 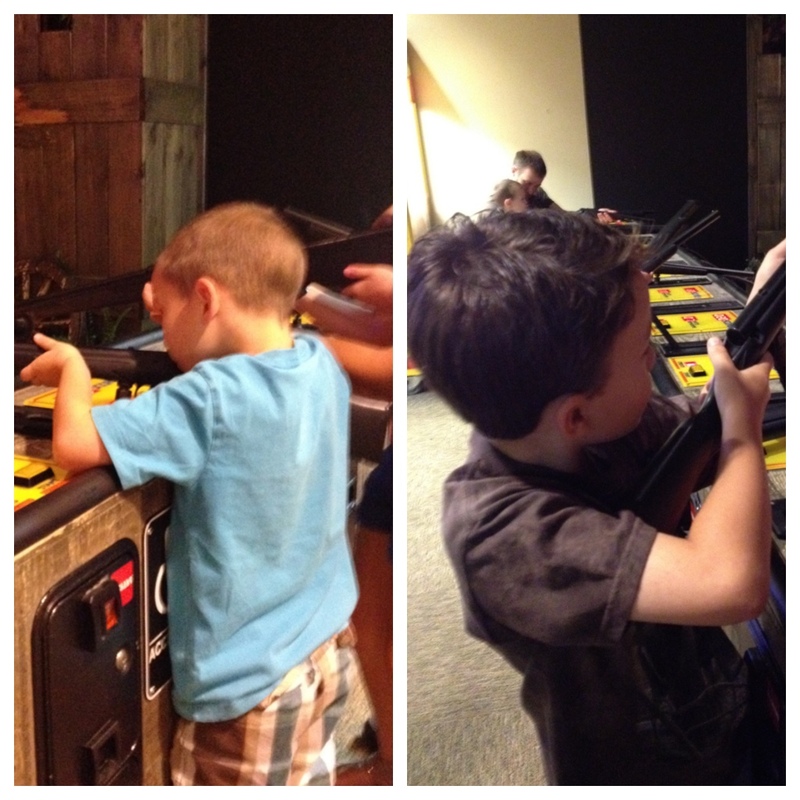 Boys shooting lions, tigers, and bears! Oh my! Kids learning about gun types and gun safety. Looking at the different fish in their huge water tank. Kids waiting in line for homemade chocolate and Oreo fudge squares.